SCOTTISH Athletics director of coaching Rodger Harkins has hailed the Scottish performances at the British indoor championships in Sheffield last weekend as further evidence of a vibrancy in the sport in Scotland following Glasgow 2014. Harkins believes athletes at all levels in Scotland can feed off the feelgood factor being generated by the county’s elite performers. Four Scots were crowned British indoor champions in Sheffield – Guy Learmonth (800m), Laura Muir (1,500m), Kirsten McAslan (400m) and Allan Smith (high jump) – as four more collected medals in a fine collective raid on Yorkshire. 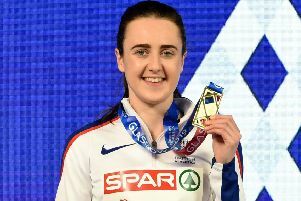 A series of PB performances fitted well with the mantra of governing body Scottish Athletics to ‘Perform When it Counts’ and, back in Glasgow, hundreds of teenagers demonstrated their desire to compete and improve by contesting medals at Age Group Championships which attracted record fields. Harkins, who was at the EIS arena in Sheffield to monitor performances and consult with athletes and coaches, hopes others can now tap in to the success enjoyed in Yorkshire. “At Scottish Athletics we are talking about ‘Perform When it Counts’ as a strategy across the whole sport but, in competition, it is athletes and coaches who have to put that into practice and I’m delighted a number of them did that in Sheffield. We keep saying it: but it is great for our young athletes to see these seniors doing well and being good role models. If people have been motivated or inspired by the Commonwealth Games, or the medals won in Zurich at the Euros last summer, then that’s great. “I wasn’t at the Emirates Arena for our Age Group Champs because I was in Sheffield obviously but the entry numbers at almost 1100 athletes should also give everyone in the sport a lift. “I believe the atmosphere was very good among the clubs, the coaches and the officials. There is a vibrancy in the sport, I think, and now it is about tapping into that and using it as a platform. Four of the eight medallists – McAslan, Jamie Bowie (bronze), Katy Brown (bronze) and Zara Asante (bronze) – had not medalled before at British level. “We’ve some new names coming through and that is growing the list of contenders we have, certainly when it comes to British Champs,” said Harkins. “Kirsten McAslan was in a really messy race, with two athletes falling adjustments had to be taken in an instant. She has run an indoor PB of 53.05 and come away with gold. I believe if the fall had not happened then she would have run under 53 seconds on Sunday. “Kirsten has another event coming up at BUCS and can try to get the Euro qualifying time. The one thing you can say is: she had the presence of mind to take advantage of it and that was good. The GB and NI selection for the European Indoors will be made next week, following this weekend’s Grand Prix in Birmingham, with Harkins hopeful a few more Scots can join Muir and Smith, whose places look assured. Meanwhile, Scotland vests are up for grabs at the National Cross Country at Falkirk on Sunday – with the biggest field for 21 years set to contest titles. The top three eligible men and women in the Senior and U20 races at Callendar Park will be automatically offered Scotland places for the Home Countries International in Antrim next month. Holder Callum Hawkins and fellow GB international Andrew Butchart look set to go head-to-head for the Scottish title after finishing first and second in Liverpool in December in a high-profile British XC Challenge race.